Expand fiber capacity by transporting multiple T1 circuits over fiber with iConverter T1/E1 multiplexers. In this riser management demarcation extension application, multiple T1 circuits and Gigabit Ethernet from a Service Provider are delivered to the demarcation point in the basement of a hi-rise building. The Service Provider is handing off service from a Metro or SONET network. Note that this application can also be located in a large, single-story building or a business park complex. The T1s and Ethernet are handed off at the Service Provider demarcation with UTP copper cables for each T1 (blue cables in the application diagram) and Ethernet (black cables). iConverter Modular T1/E1 Multiplexers are installed in a 19-Module Chassis at the demarcation point in the basement. This flexible and scalable system is comprised of an iConverter Fiber Transport module, and one or more iConverter 4xT1/E1 MUX modules installed the chassis. Multiple MUX groups can be installed in a chassis, with the copper T1s connected to the RJ-45 ports in the 4xT1/E1 MUX modules, and the Ethernet to the RJ-45 port on the Fiber Transport Module. All of the T1s and Ethernet are transported via the fiber port on the Fiber Transport Module. An iConverter NMM2 Network Management Module is also installed in the chassis to enable SNMP v1/v2c/v3 or TELNET management of the T1 Multiplexers. The T1 Multiplexers are deployed as bookends, with the same module configuration (and number of ports) at each end of the fiber link. On the 11th floor, up to four T1 circuits are transported over the fiber link to the tenant office. The fiber is connected to a fixed configuration iConverter 4xT1/E1 MUX/M that converts the T1s back to native copper RJ-45 interfaces that are connected with UTP cables to a PBX. On the 12th floor, up to sixteen T1 circuits are transported over the fiber link to the tenant office. The fiber is connected to a fixed configuration iConverter T1/E1 MUX/M that converts the T1s back to copper that connects to a PBX. Gigabit Ethernet is also transported over the fiber and converted to copper that connects to an Ethernet switch with a UTP cable. The iConverter T1/E1 Multiplexers are part of the Multi-Service Platform that enables property owners and riser management companies to provide reliable fiber connectivity between Service Provider demarcation point and the tenant’s network equipment. The iConverter Multi-Service Platform preserves network hardware investments, and the management system also lowers operating costs by providing fault notification and troubleshooting tools that reduce down-time and trips to tenant equipment. 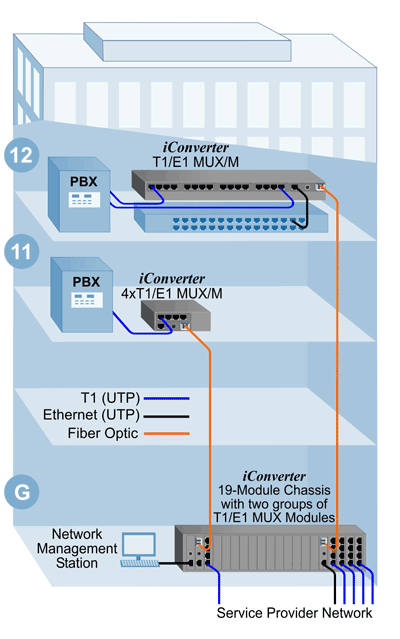 In this application, four T1s are extended between two PBXs using a iConverter 4xT1/E1 MUX at end of a fiber link. The native T1 copper from the PBX is connected to the RJ-45 ports on the T1 MUX, and transported over fiber to the MUX at the other end. Multimode or single-mode fiber can be used, and fiber links can be extended up to 120km using single-mode fiber. A 4xT1/E1 MUX/M can also be deployed that provides SNMP v1/V2c/v3 management through an Ethernet RJ-45 port.